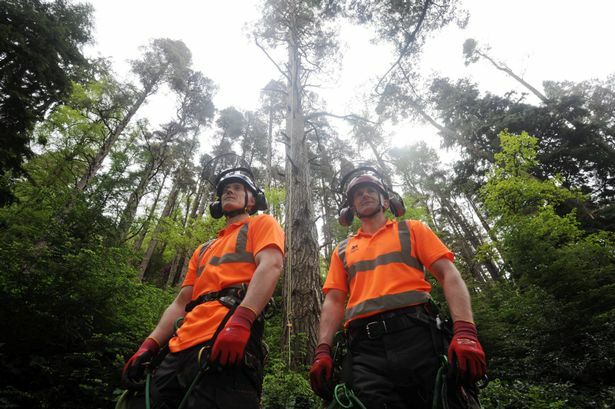 Staff at Cragside in Northumberland are on a high as a 140-year-old Scots pine growing in its grounds has been declared the tallest in the UK. Standing 40 metres - the height of 10 stacked double-decker buses - the huge tree took the top slot after specialists managed to scale it to get an accurate measurement. It also becomes the 200,000th tree to be recorded since an official register was started in 1988. The announcement, which will no doubt bring an extra influx of visitors to the National Trust property on the outskirts of Rothbury, has delighted Cragside’s tree and woodland manager Chris Clues who calls it a “breath-taking” tree and is now hoping to identify more champions in the grounds. “We’re absolutely thrilled if a little surprised to have the UK’s tallest Scots pine,” he said. “You might imagine that Scotland would lay claim to that record. But a lot of these trees are grown commercially and felled at quite a young age. “Since being planted in the 1870s our Scots pines have thankfully been left alone and are now part of the landscape. It was the admiring comments from visitors that prompted The National Trust to give the tall order to specialist arboriculturists to measure the tree. Then its confirmation as the biggest of its kind in Britain came from officials of the Tree Register organisation which keeps the tally of notable and ancient specimens. Cragside’s record pine, which stands surrounded by Douglas firs on the hillside behind the main car park, is one of seven million trees and shrubs planted in the latter half of the 19th Century by the first Lord and Lady Armstrong, who transformed the site to create a now Grade l-listed garden and woodland estate for a mansion which pioneered hydro-electric power. There are other notable trees in the area. Among them are Seaton Delaval Hall’s 300-year-old weeping ash; Wallington’s horse chestnut planted by the Irish playwright George Bernard Shaw; and ones at Staward Gorge, in the North Pennines, whose barks were carved by Italian prisoners of war with their Second World War identification numbers. Gibside, meanwhile, has one of the largest Norway maples in the county as well as a fallen 200-year-old wild cherry which continues to grow and blossom; and walkers at Hadrian’s Wall can spot the lone sycamore which had a starring role in 1991 movie Robin Hood: Prince of Thieves. Paul Hewitt, countryside manager at Wallington in Northumberland which has just launched its own tree trail, hopes more visitors will want to learn learn about Britain’s trees.